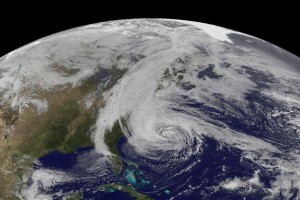 Image of Hurricane Sandy from NASA. As this is published, so-called “Frankenstorm” hurricane Sandy is flooding large swaths of the American east coast. The deaths of more than sixty people in the Caribbean will likely represent this historic storm’s most direct and poignant toll. However, as reports of devastation come in from across the most densely populated regions of the United States it is the hurricane’s potential to influence the American election and, possibly, the shape of the world in years to come that has most captured the world’s attention. Whether the worst fears of meteorologists come to pass or not, Sandy presents a unique “teachable moment” for historians of climates past, many of whom study interactions between weather and historical events. The most fundamental lesson we can glean from the impending catastrophe is simply that weather affects history. Most historical narratives still focus on events within purely human spheres, describing changes in relationships between classes, for example, or cultural trends. The rise of post-modernism in particular has left some historians suspicious of attempts to describe environmental influences and, ultimately, “what really happened.” Of course, there are the limits – both practical and conceptual – that cloud our ability to reconstruct the past and make sense of relationships between human histories and, for example, severe weather events. Nevertheless, hurricane Sandy reveals that many histories are little more than interesting stories unless they at least attempt to address environmental influences. A second lesson that will become increasingly evident in coming days, weeks and years is similarly simple: some of hurricane Sandy’s most important influences will be counter-intuitive. We may find, for example, that widespread fear drove many people to vote early, paradoxically increasing voter turnout. As I charted how weather patterns influenced by past climatic shifts affected Dutch East India Company ship journeys, for example, I expected to find that more frequent storms in colder climates proved devastating to the Company and its sailors. Instead, because East Indiamen were gigantic, solidly-built ships, many storms actually benefited crews by pushing their ships forward more quickly with their high winds. Because so many sailors died of disease while at sea, shortened journeys, influenced by storms, probably saved lives. Environmental influences are rarely straightforward, and historians of climate know this better than most. In the aftermath of hurricane Sandy’s landfall, it is likely that many will describe how the storm “caused” devastation along the East Coast and, in turn, altered the election. The third and final lesson, then, is that weather events are but one influence among many. Natural disasters occur at the intersection of human and environmental histories; indeed, while “natural” usually refers to stimuli that, at least until recently, have largely existed beyond human influence, there is no “disaster” without human settlement. Teasing out how exactly hurricane Sandy affected the East Coast, how it helped change the election, and what social structures were especially vulnerable will be a painstaking task. Luckily, there is an entire field of study devoted to unraveling those relationships. Dagomar Degroot is a PhD Candidate at York University, where he explores the relationship between the climatic and human histories of the Dutch Republic. He is the creator of HistoricalClimatology.com, and the co-administrator of the Climate History Network.